Twistfix have seen a huge increase in sales of its range of helical wall ties. Builders, architects and structural engineers continue to use and specify the full range of drive-in cavity wall ties supplied by Twistfix in the knowledge that they conform with CE Marking requirements in a wide array of construction materials. 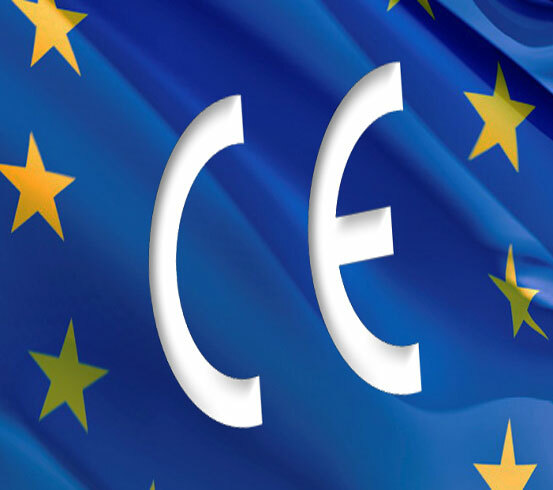 Under the EU Construction Products Regulation, all construction products that are covered under a harmonised European standard must carry the CE mark, or they cannot legally be sold in European Union Counties, including in the UK. The current harmonised European standard for wall ties is EN 845-1:2013. Strong yet flexible, timber frame wall ties secure masonry façades to timber frame structures in both new-build and retrofit applications. Multiple drip points are ensured by the continuous helix of these self-tapping wall ties, which are designed to accommodate a generous amount of differential movement in structures up to 15M high. These masonry ties, formed from stainless steel which shows exceptional resistance to corrosion, work flawlessly with Aircrete blocks such as Celcon, Durox and Thermalite. Driven directly into the blocks by a repeated series of powerful yet precise axial impacts, the thin joint wall ties spiral effortlessly into the blockwork, utilising accurate helical pitch technology to ensure perfect interlocking and maximum performance every time. It is not uncommon for new houses to be built with insufficient or incorrectly fitted wall tying systems. On such occassions the installation of retrofit ties is required before the house can be signed off by the NHBC. Our replacement helical wall ties are quickly, easily and reliably installed to re-tie existing walls. The ties are hammered into pilot holes using a hammer drill attachment, where they immediately corkscrew into the masonry and strongly grip within an interlocking helical undercut. Replacement ties from Twistfix are in constant demand for re-tying cavity walls in new buildings and in older structures. 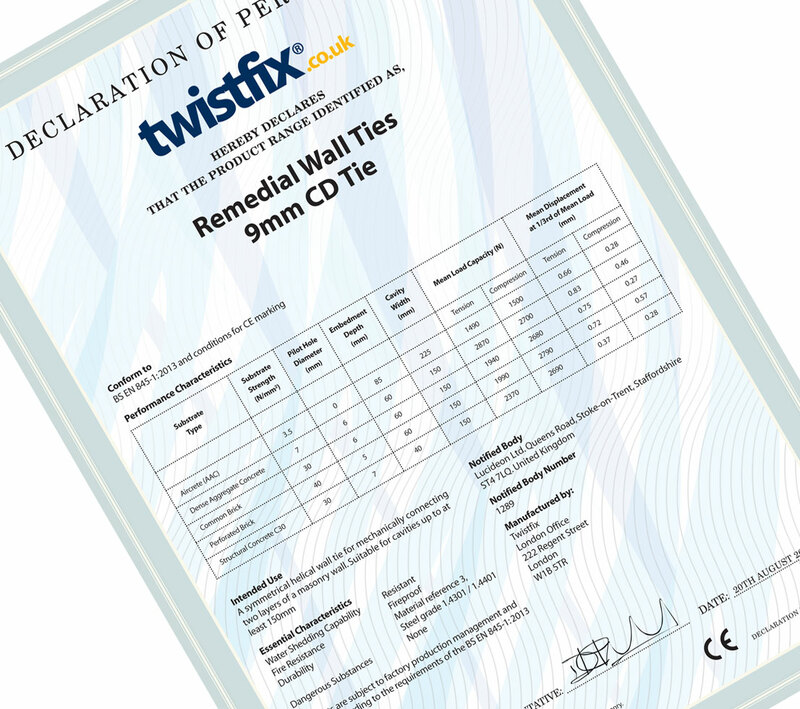 To ensure that we were supplying our contractors with the safest, strongest wall ties, our remedial ties were independently tested in 2009 by the Institute of Technology Construction, a notified body based in Denmark. After a gruelling barrage of tests in a wide variety of brick types, the retrofit ties were the first in Europe to be awarded the CE Mark in testament to their reliabile performance in brickwork. Recently a new test programme carried out by UK notified body Lucideon (formerly known as CERAM) has greatly extended the scope of CE mark compliance, which now takes into account smaller embedment depths and increased cavity widths of up to 150mm. As well as testing in bricks and perforated masonry, the new tests also establish the efficiency and suitability of our retrofit helical wall ties in dense aggregate block, structural concrete and lightweight aircrete blockwork (AAC). Once again, the 9mm CD wall ties were easily able to withstand the demanding pressures placed on them in the laboratory. The comprehensive test program on the performance of Thor Helical CD Ties has delivered CE Marking that is valid as being compliant with EN 845-1:2013 across a far greater range of masonry substrates and cavity widths than is the case with any other retrofit wall tie of similar design and function. We invite you to browse our CE Marked collection of wall ties and to contact our skilled technical team for further information. Twistfix - the professional standard.